South Korean mobile carrier LG Uplus Corp. has been tapped by Nvidia to exclusively roll out the cloud-gaming service GeForce Now in Korea, allowing local users to play hundreds of games via their 5G smartphones, personal computers and internet-connected televisions. The Korean company said Thursday it plans to set up a domestic data center to host the GeForce Now server. The cloud platform would support more than 500 online PC games including Fortnite, League of Legends that can be downloaded in seconds and ready for play without gamers having to worry about upgrading or patching. The move is part of LG Uplus’ efforts to package cloud gaming as one of its core 5G services, with competition heating up among Korean wireless players in winning over customers during the generational shift to 5G mobility. 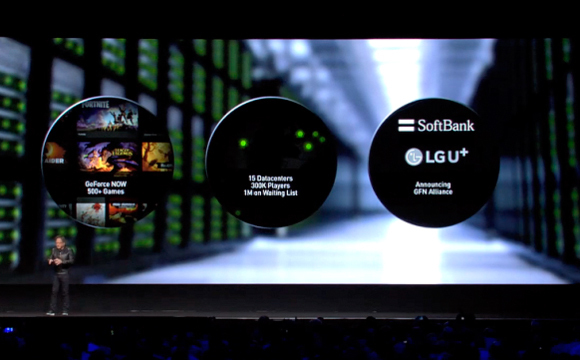 LG Uplus and Japan’s Softbank would be among the first partners to deploy the cloud gaming servers, Jensen Huang, co-founder and chief executive of Nvidia, announced Monday at Nvidia’s GPU Technology Conference. Nvidia has been running a beta program for its highly-anticipated GeForce Now service for the past two years, with 300,000 users in the United States and Western Europe and a million more on the waiting list.